Represents the state in all appeals from cases prosecuted by the Department of the Prosecuting Attorney. Appellate also helps research case law for deputies in trials. Prosecutes cases involving defendants who commit felony offenses while on probation or parole. These cases are important because these defendants will be facing mandatory minimum sentences upon conviction. Specialized unit that practices vertical prosecution, meaning deputies handle individual cases from charging to trial. This helps to lessen stress as the victim only deals with one attorney. Receives investigative reports of crimes from the Honolulu Police Department and works with police to determine appropriate charges. Screening deputies also present cases to the Oahu Grand Jury. Specialize unit that vertically prosecutes cases involving victims 60 years and older. Deputies also work extensively to educate and inform seniors about financial fraud. Investigates and prosecutes cases involving financial fraud and computer-based crimes, including theft, identity theft, money laundering and wire fraud. Prosecutes all cases over which Circuit Court has jurisdiction. These include murder, manslaughter, robbery, burglary, arson and assault. Prosecutes any act or violence or threat of violence between people who are or have been in a relationship or have a child together. This can include coercion and intimidation or disregarding a restraining order. Domestic violence can be a felony or misdemeanor based on the extent of injury. Handles cases involving defendants under the age of 18. 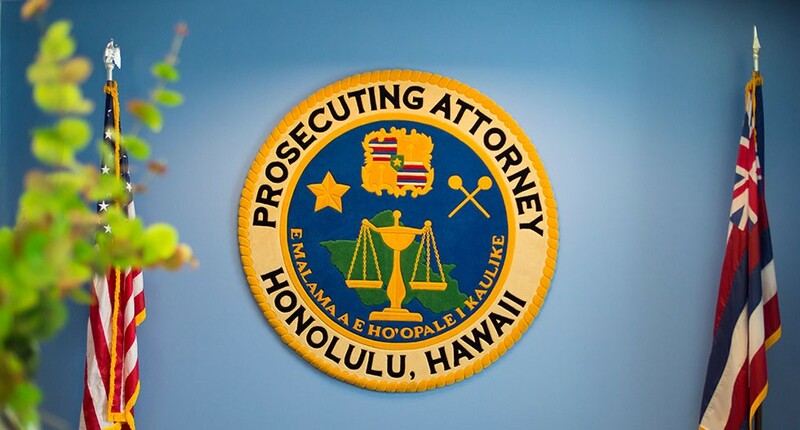 Conducts arraignments and trials in District Court brances in Honolulu, Pearl City, Wahiawa, Kaneohe and Kapolei. These cases typically include traffic violations such as drunk driving and speeding, and petty and full misdemeanors. Offers an array of services to help victims cope with the aftermath of a crime and provides support as a case makes its way through the criminal justice system. This includes crisis counseling, accompaniment to court appearances, notification of major case developments and assistance in filing for compensation. Duties include providing security for department personnel, transporting and protecting witnesses, locating material witnesses, arresting defendants named in warrants, conducting investigations and producing reports for cases being readied for trial.